Instant Pot Beef Stew Recipe – Try It Today! A delicious beef stew recipe for your instant pot, because your family deserves the best! Although we’re a family of two, this instant pot beef stew recipe is perfect for families of all sizes. Make an entire batch and vacuum seal the leftovers for another time, too! This recipe is great for any time of year, it is especially delicious during the cold winter months. Because it warms you up so well, this instant pot beef stew recipe screams winter! The groundhog may have predicted an early spring, but we all know how that works out! When you come in from shoveling the snow, snowshoeing, ice fishing, or just playing outside in the cold weather, you want something hot and delicious waiting. 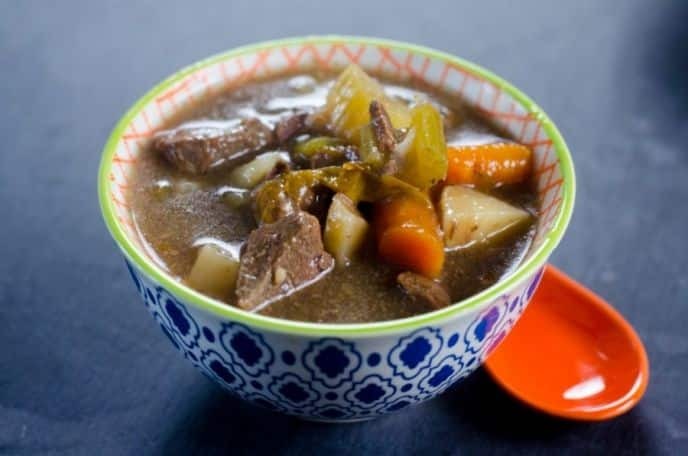 This instant pot beef stew recipe fits the bill! Despite our busy lives, we can have this Instant Pot beef stew recipe on the table in 45 minutes from start to finish! It’s real easy to make and your entire family will love it. Get an instant pot HERE! A cold winter night, Christmas eve perhaps, or just a boring cold Saturday afternoon, or for a family weeknight dinner, this beef stew instant pot recipe will hit the spot! Set instant pot to saute mode, add in meat and onions. Brown meat and turn off saute mode. Add in carrots, celery, potatoes, and cover with beef broth. Fill with water to fill line. Stir in garlic, bay leaves, maggi, salt, and pepper. Place lid on instant pot. Set to high pressure for 30 minutes. Once the pot is done counting release pressure. Add two tablespoon of cornstarch to 1/3 cup water. Whisk well. Pour into instant pot stirring frequently. Set instant pot to saute mode. Bring to a low boil until cornstarch has thickened the broth then turn off saute and set to keep warm. Pro tip: I remove all the vegetables to a large bowl then add the cornstarch. It helps so the vegetables don’t break down to mush. It can be done either way. So whether you have a large family or small, it’s the middle of summer or the dead of winter, this beef stew recipe will hit the spot. There’s nothing like a warm bowl of beef stew to show your family how much you care! Instant Pot Beef Stew Recipe. Set instant pot to saute mode. In the instant pot, add in meat and onions. Brown meat and turn off saute mode. This beef stew recipe is perfect to make in your Instant Pot.